You need to know that not all Persimmons are the same. The orange tomato-like fruit, Diospyros kaki, originated in China and thereafter became highly valued in Japan at least a thousand years ago. They fall into two types: the astringent hachiya persimmon and the non-astringent ones like fuyu or Jiro. You sometimes see persimmons labelled as Kaki or Sharon to identify them as the non-astringent persimmon developed in the Israeli Sharron Valley (though these days much of that commercial crop is grown in Spain). The non-astringent fruits can be eaten at any stage from firm (good used sliced in salads or baked), through to soft, when they can be eaten uncooked as a dessert. The astringent hachiya persimmon, on the other hand, is way too sharp to eat until the juicy, almost jellied flesh is practically bursting out of its skin. They tend to be larger than their cousins. The plum-like shape settles into a voluptuous round when very ripe. Whenever possible, we buy persimmons from Italy where they are known as Cacchi. Late October to December is their season. Sometimes they arrive still a little firm, which means our customers need to keep them a week or so until they ripen. At other times they come through our doors at their ripe, honeyed best, nestled in protective trays, looking like translucent deep-amber jelly bombs. Handle with care! In Italy, the provinces of Salerno, Napoli and Caserta are particularly persimmon growing regions. The writer Patience Gray, in her book Honey from a Weed, writing in the 1980s, describes the persimmon trees being of “great splendour”, their fruits pale green turning to “burning gold remaining on the tree long after its leaves have fallen”. She remembers the Tiber Valley and the valleys between Naples and Benevento being illuminated by them in late autumn. Gray also recounts being told how, in Japan, some fruits are left on the tree deliberately until the frosts arrive and turn the soft pulp into instant sorbet. And dried persimmons have long been an integral part of traditional Japanese New Year celebrations. There is a smaller, plum-sized, variety of Persimmon native to America – Diospyros virginiana – which, when found growing in the wild by settlers, was described as like a medlar or sorb which must be left to break down until soft and pulpy. It was then commonly used in stewed fruit puddings. There’s a Mexican persimmon too, known as the black sapote or black persimmon, also known as the chocolate pudding fruit for its taste resemblance. With both main types of persimmon we see here, when ripe, you need do very little to them. You can peel the ripe fruits and freeze the pulp for a sorbet – no added sugar required. The pulp also makes a good base for a steamed sponge pudding or can be used wherever a thick fruit puree is needed – a fool or mousse for instance. But best of all, if you have a persimmon at bursting point, is just to slice the fruit in half and dip your spoon in – maybe adding a little cream. Autumn finally arrived here in the UK in the last week of October. The unseasonably warm, sunny days have been tempered by brisk northerly winds, though blue skies and sunshine haven’t totally abandoned our isles. Here at Puntarelle & Co we see the change of seasons clearly, and not just in the chill morning start to our day. Our choice of fruits is paired-back now. Yes, we could select southern hemisphere strawberries and peaches but we choose not to. Our customers recognise and appreciate the seasonal shift in foods and so do we. And there is so much to enjoy through November. Apples from brothers Ken and John, who grow fruit on our favoured farm in Kent and have been topping off our fruit crates with the most beautiful boughs of crab apples this year. Pears, from the same source, include Doyenne du Comice and Conference. The English Quince crop is outstanding this year. The weather has suited them particularly well producing large, good-keeping fruits. We expect to have some of the French crop soon too. Our display of Organic varieties of Pumpkin and Winter Squash is growing by the day. Click on the link to our focus piece from last year to find your favourite. Sweet, nutty Fenland Celery has arrived this week. It will be with us for just a few short weeks. Our favourite greens at this time of year has to be Rainbow Chard , its vibrant stems of orange, pinks and reds are standing out amongst the Purple Sprouting Broccoli and Cavolo Nero/Black Cabbage. Though the colourful Kale varieties are giving some competition for colour so early in their season. Cabbages have had their first nips of frost, making Primo, Red and White all taste fantastic now and you can expect to see Brussels Tops and Brussels Sprouts right through the cold months along with Heritage Carrots, Parsnips, Celeriac, Parsley Root and Turnips. Potatoes at the moment are waxy Pink Fir Apple, King Edwards for roasting and mashing and Cyprus which is a good all-rounder. We have small amounts of Chanterelles and Girolles Mushrooms from Scotland. We are getting beautiful Sicilian Pomegranates this year, large and sweet/sharp juicy with great colour. Flavourful Fennel is coming directly from Verona right now. Hard to believe but we are still getting crunchy Romano Courgettes and some tasty Sorrento Tomatoes as I write this at the very start of November. Beautiful Persimmons are arriving from Italy now, some perfectly ripe which are very difficult to transport, and others which need only a week in a warm kitchen to come to perfection. The bitter cold-weather leaves are now arriving. Mildly bitter, juicy Puntarelle is in, so good served with an anchovy sauce. Broad-leaved Cima di Rapa and Chicoria, with its dandelion-like leaves began arriving in late October. Both great winter greens to serve up alongside our English root vegetables. We have sweet-fleshed Delica Squash in now. They have a rich, nutty flavour and are very plentiful. We always look forward to the varieties of Chicory leaf that begin to arrive after the first cold snaps. Expect to see green/yellow Endives like curly Frisee, large floppy-headed Escarole alongside colourful Radicchios like speckled Castelfranco, deep red leaved Tardivo and Treviso and the pink Rose Radicchio from November onwards. On the Citrus front, apart from Bergamots and some Miyagawa Mandarins, we are receiving new season Navelina oranges but we will have to wait till December for the blood orange season to get going. Seasonal specials this month are: Fresh Cranberries, Walnuts in their shells and vacuum-packed chestnuts. We have been concerned for some time about the amount of packaging there is in our dry goods section. We recognise that, like most food businesses, we still have a lot to do to get to where we want to be on the sustainability front. Visits to Italy, where dried pulses are often sold scooped from the sack rather than pre-packed, have inspired us to do the same. A visit to Puglia this August, where selling loose pulses is commonplace, provided us with the spur to adopt this more sustainable model. We have sourced Italian grown beans, rice and grains which our customers will now be able to scoop-up in the quantities they want into reusable bags. We are also pleased to announce that we have sourced our first organic cold-pressed olive oil from Campania / Italy, by Bufano olive oil mill. This oil has been bottled specially for us by . We should have this for sale the second week in November. We are very happy with how London Fermentary is developing and excited to announce that we have nutritionist Olga Bonde joining our team. She will be working with us on production and as a consultant to help us develop our brand. Some of you will already have met Oona who has been running customer tastings every Saturday morning for the past few weeks. Please pop in to try our fermented food and drinks between 09.00-13.00. Our Inspirational Fermentation Courses are proving to be a great success so we have developed a ONE full-day workshop for people who cannot commit to the 3-week course. The first course will run on 16 January 2019. Click to find out. The english Apple crop is so good this year, not only is it plentiful but the fruits are crisp and delicious throughout the varieties. So, this month we have a recipe for using these fantastic seasonal fruits. Combine the flours and salt. Make a well in the centre and add the egg and a little milk then start to draw in the dry ingredients to the wet, adding more of the milk and water gradually until you have a smooth batter. Add the melted butter and mix in. Lightly butter a 20cm heavy-based frying pan and heat to medium-hot. Keep the heat at this level throughout. Pour in enough pancake mixture to quickly swirl it around the pan and lightly coat it and cook until the underside is lightly browned. This is a sacrificial one as the first pancake is always poor so discard it. Add just a little butter before cooking each pancake. Pour about 2-3 tablespoons of batter into the pan and quickly swirl it around the pan to coat it thinly. Brown lightly and turn the pancake to lightly brown the other side. Repeat the process and when each pancake is light browned on both sides add it to a plate and keep warm in a low oven until you have used up all the mixture. Spoon a heaped tablespoon of the warm apple and raisin compote onto each pancake and add some of the chopped walnuts folding the pancakes over. Serve with cream. Puntarelle, our namesake, is a member of the chicory family (Cichorium). This Cichorium Catalogna is also sometimes referred to as Asparagus Chicory. It’s a cold weather crop, usually at its best between November and February and, as it is coming into its prime season, it’s a good time to focus on it. Grown in Italy, it’s a crop particularly valued by Romans who have a taste for the bitterness of all Cicorie. Pick up a Puntarelle and you’ll be surprised by its weightiness. The long, jagged, dandelion-like leaves embrace a heart of hollow, pale green, knobbly shoots looking a little like short, fat, pale asparagus spears. The vibrant outer overlapping leaves are sweet with a welcome touch of bitterness that comes through particularly when the leaves are cooked. They deliver a welcome astringent punch in the depths of winter to add variety to our diet of home grown greens. Salads of bitter greens are often dressed with something salty as salt not only balances the bitterness but actually suppresses our perception of bitterness. The knobbly, juicy heart and the inner leaves make a delicious salad. The classic Italian way is to toss the raw thinly sliced shoots in an anchovy vinaigrette. The tougher outer leaves can be braised in a pan with a splash of water, a pinch of salt and a knob of butter until just wilted. Delicious mixed with some fried bacon or pancetta and piled on toasted bread. Carrots are such a staple of the kitchen that it’s easy to take them for granted. Once, they were as exotic here as aubergines, courgettes and peppers were before Elizabeth David’s influential A Book of Mediterranean Food, (widely credited with creating demand). The familiar bunch of orange carrots we pick up as part of our weekly shop derive from a purple carrot grown first in Afghanistan in the 7th century. The Moors are credited with its spread to Western Europe along with a yellow mutant root. It’s thought the Dutch, brought the two together to produce the now ubiquitous bright orange carrot that, since the 19th century, has been a common standby vegetable in British kitchens. After many years of breeding ever sweeter and more uniform carrots, we are now seeing a return to more interesting varieties like Chantenay, Violet and De Djerba as we find a new appreciation for the more earthy, darker-hued carrots from which they originate. A variety we are always happy to see is the Sand Carrot (Carotte de Créances or Carotte de Sable). Grown in an around eight villages in the Créances Basin on the west coast of Normandy, they are deep orange in colour. Their flavour owes much to the sandy soil which has been fertilised with seaweed for generations. The legendary fruit and veg man Charlie Hicks, who sadly died in 2018, has more to say on the subject of Sand Carrots here. The gentle frying together of onion, carrot and celery (and sometime one or two other ingredients) occurs in many cuisines – in Italy it makes a soffritto, in France and in Britain it’s a mirepoix, Spain has its sofrito, while Germany’s mix is Suppengrün. This combination is often referred to as the aromatics and is the start to a huge number of European dishes. The carrot’s sugar content is relatively high – it can be as much as 5% - which means it lends itself to inclusion in both savoury and sweet dishes. Later in the year they grow a little less sweet. In milder areas carrots can be left in the ground well into winter if their tops are cut off to avoid being nipped by frost. When buying carrots, the green of their tops is a good indication of how freshly they have been dug. However, carrots keep better with their tops removed, loosely wrapped and placed in the coldest part of your fridge. Carrots take to spices very well. Coriander, cumin and caraway are particularly suited. Very sweet carrots can benefit from the zing of acidity a splash of orange juice brings. Summer-harvested carrots need only to be washed and eaten raw or lightly cooked. Peeling is often unnecessary. A plate of raw carrots, cucumber, fennel and radish served with bowls of Hummus or aioli is redolent of summer picnics. In France it’s almost mandatory to have some dressed shredded carrot on the school lunch plate - some roasted pumpkin or sunflower seeds is a nice addition. Simon Hopkinson, in his book The Vegetarian Option, has a fresh and zingy Carrot salad with coriander and green chilli – toss 300g of peeled and grated carrot in a mix of 1½ tsp of sea salt,1½ tsp of sugar and the juice of 1 lime and leave to macerate for 30 minutes. Toast and lightly crush 1 tsp of coriander seeds. Chop some coriander leaves and a green chilli together and mix them with the carrots. If you have the barbecue going, or a grill pan, parboil carrots whole, toss in a vinaigrette dressing and grill them until just tender. As the year moves on we look for different ways to use carrots. Nigel Slater has a recipe for Carrot and coriander fritters. The carrot, grated with onion and garlic, is bound with egg, cream, cheese and a little flour before being shallow fried. In autumn, when roasted with other root vegetables, like turnip and parsnip, the carrots’ sweetness tempers the stronger earthiness of the other roots. They bring an earthy sweetness to many of the soups and stews we start to crave. The classic French Potage Crecy or Carrot and Coriander soup have stood the test of time. Braised or boiled Beef and Carrots is more of a British classic and caramelised carrots are a beautiful accompaniment to a rich Oxtail Stew. Harnessing the sweet nature of carrots, there’s an 18th century ‘English Carrot Pudding’, which today we’d see as an open pastry tart, filled with grated carrot, breadcrumbs, eggs, cream, butter, a little sugar and brandy. There’s classic Carrot Cake with its lightly sweetened cream-cheese topping, of course. In India, there’s fudgy Halwa – grated carrot softened in butter, condensed milk and ground cardamom. Meera Sodha, in her book Fresh India, serves her Halwa with caramelized garam masala pecan nuts. 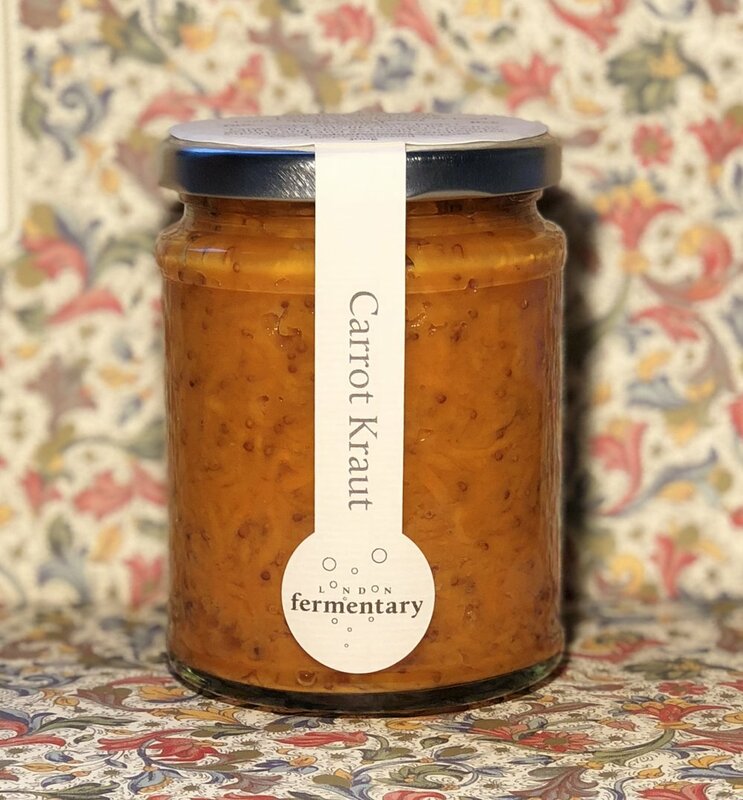 Versatile carrots also preserve well as jam/marmalade, chutneys, pickles and ferments. Beetroot is not the prettiest of vegetables in the box but once cooked their jewel-like colours reveal themselves. Beet leaves, or Chard, have been eaten for thousands of years. The roots of specialized varieties were valued in ancient Greece. Initially, the roots were either red or white and grew long and tapered. German gardeners are credited with developing the roots in the Middle Ages but it wasn’t until the 16th century that we saw depictions of fat, round red varieties. Today we commonly see pink, red, yellow and orange Beetroots. They all have an earthy flavour and their relatively high natural sugar content (around 3%) is why beetroots lend themselves to being paired with chocolate in cakes. They are a good source of folic acid, fibre, manganese and potassium. The leaves are high in calcium, iron and vitamins A and C and can be eaten raw if small or cooked liked spinach or chard. Depending on type and size, Beetroot can take 45 minutes - 2 hours to cook so it makes sense to choose even-sized roots. Prevent, particularly red varieties, from ‘bleeding’ their juice by cooking them with any whiskery roots and 2cm of stalk intact. Roasting at no more than 180C in a foil-covered tin retains the most flavour, but they can be boiled in salted water. Resist the temptation to test for doneness with a knife tip to avoid ‘bleeding’. They are cooked when the skin wrinkles and comes away easily. Salty foods balance out the innate sweetness of Beetroots. Anchovies, capers or goat’s cheese are perfect for this. Oily salted fish like herring, or smoked salmon are good to. The grassy notes of the herb dill respond to the beetroot’s qualities and they are often paired in Eastern European cuisines, soured cream bringing the two together most successfully. And the go-to spices for Beetroot are smoky, citrusy cumin or musky toasted caraway seeds. A good dollop of hot mustard peps-up beetroot no end. What to make? With nothing to temper its earthiness, raw Beetroot is not to everyone’s taste – though Chioggia or Candy varieties are milder than the dark red varieties - but juicing them is the healthy way to go. Recent medical studies have shown drinking beetroot juice is a natural way to reduce blood pressure. Grated raw roots are good mixed with grated carrot and an oil and citrus dressing, or with celeriac and a mustardy mayonnaise dressing. Make a Scandinavian Beetroot and Herring salad: salt herrings, boiled beetroot, cooked potato, apple, raw onion, hard-boiled eggs and parsley. A classic salad of vinaigrette-dressed Beetroot and Goat’s cheese with walnuts - plated at the last minute so that the lovely white of the cheese isn’t too marred by the bloody beets. An Indian Beetroot Raiti, on the other hand, positively celebrates the vivid result of beetroot meeting dairy. And, of course, there’s Borscht, the celebrated beetroot soup that originated in present-day Ukraine. Beetroots also respond wonderfully well to being fermented. If you don’t want to do this yourself, take a look at our London Fermentary fridge – definitely good for your health! Summer holidays have come to an end but summer seems reluctant to morph into Autumn here. Apples and pears are coming through the doors in abundance, yet Sweetcorn is still arriving. Apples coming from our favoured farm in Kent include Early Windsor, Greensleeves, Spartan, Orange Pippin, and Worcesters. Pears too are plentiful and include Doyenne du Comice, Conference and Triumph of Vienna - an old French variety with red flush, russet-patched skin and smooth, juicy white flesh. The English Quince crop is looking particularly good this year and you will find them on our shelves now. We have fantastic Rainbow Chard, Swiss Chard, and Purple Sprouting Broccoli right now along with Cavolo Nero/Black Cabbage, Cauliflowers and crunchy Kohlrabi. Brussels Sprouts seem to appear earlier and earlier each year and, yes, they are in already. Some Pumpkin and Winter Squash are starting to arrive too. We have Chanterelles and Girolles from Scotland and expect to have them throughout the month. Wet Walnuts arrived in late September and we expect to have them through October. Black Figs are still coming in although, surprisingly, the crop hasn’t been good this year. Coco de Paimpol beans are still with us. 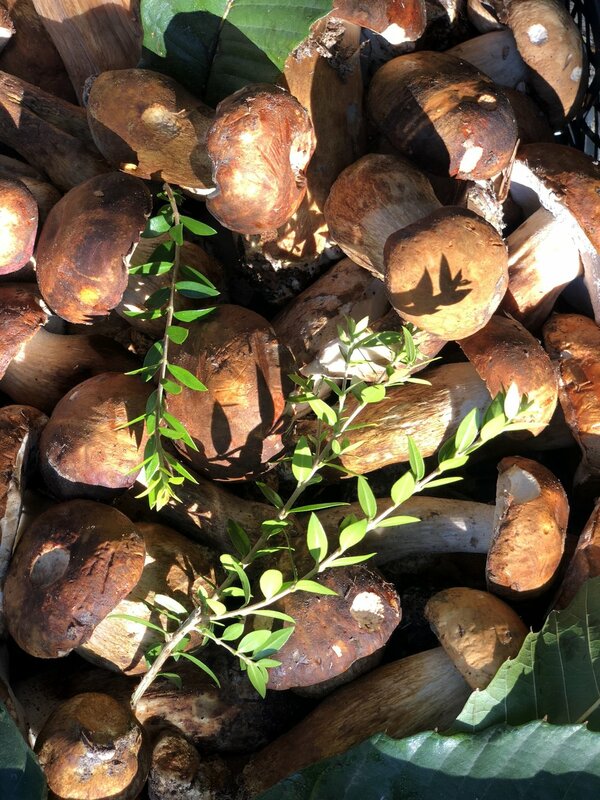 Some of our Autumn Mushrooms may come in from France too. This month Italian Peaches and melons give way to strawberry/exotic fruits-flavoured Fragola Grapes and delicate-pink Pomegranates from Puglia. 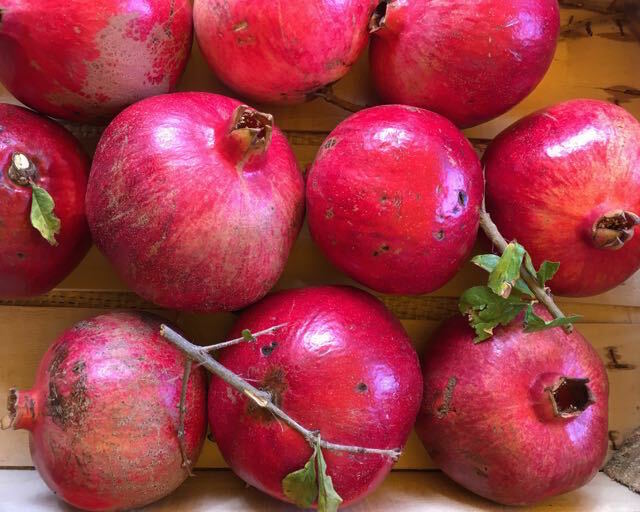 They may not be as eye-catching as the deep-red Turkish variety but are a beautiful lead-in to the full pomegranate season. The start of the new citrus season always excites and, happily, zingy Miyagawa Mandarins and early, unwaxed, Navelina Oranges are already in . We’ll have to wait for the new season Italian lemons but expect Bergamots to be in this month. Persimmons are just beginning to arrive as I write. New season Artichokes, bitter-leaved Chicoria and Cima di Rapa are on the shelves and we can expect to have them throughout October. In our London Fermentary fridges in October you can expect to find seasonal Water Kefir flavours like Fragola Grape and zingy Green Mandarin. With such an amazing crop of Apples and Pears coming into the arch right now, we have to point you to this simple recipe that tastes so perfectly seasonal. You can find a full version in Nigel Slater’s book Tender: Volume II. It’s delicious but if you want to add a little texture, a scattering of a few toasted almonds is good. Peels the pears, cut in half and scoop out the cores. Bring sugar and water to the boil, add the pears and reduce to a simmer. Cook for 10-15 minutes until just beginning to feel tender. Lift the pear halves from the syrup and discard the liquid. Heat the oven to 180C (160C fan)/Gas 4. Place the pears in a shallow baking dish. Drizzle them with the maple syrup and the vanilla extract. Bake them for around 1 hour or until the pears are meltingly soft and pale gold here and there. Serve with or without cream. We always have cultivated mushrooms but September sees the arrival of the wild Chanterelles and Girolles from Scotland, soon followed by Ceps from France and Italian Porcini. With mushrooms, common names can be confusing, particularly when it comes to Chanterelle and Girolle. Chanterelle refers to a whole family of wild mushrooms (Cantharellus) which includes the Girolle (C. cibareus), but the Girolle is often sold under its own species name. Either naming is correct but the Girolle is distinctive, being yellow with meaty, white flesh when cut and a slight aroma of fruit, likened to apricots. It retains its texture when cooked. Whereas the Chanterelle species we most often get has a brown cap with a spindly yellow stem and cooks to a soft brown mass. We can expect to see both coming through our doors well into November, mostly from Scotland where they are happy growing in moss-covered ground. Porcini/Ceps mostly come in to us from France and Italy. Growing near oak, beech, birch and coniferous trees, they can range hugely in size. They have a cap that looks like a crusty bread roll - which is why, in the UK, they are also known as Penny Bun - and a stem that is thick and swollen. Underneath, its fine white pores age to yellow, then become green and spongy. It’s hard to disagree that this is the king of mushrooms for its firm texture and earthy, mildly meaty flavour. The small ones are good sliced and eaten raw. Frying is the best way to cook mushrooms. The oil or butter should be heated to sear the mushrooms and seasoning should be at the end of cooking as salt will draw out their water content and result in a stew rather than the desirable caramel sweetness. Sautéed mushrooms with chopped shallot and garlic, with chopped parsley added at the end, needs only a slice of toasted bread, or, maybe, some scrambled egg. Add fried mushrooms to a buttery pasta or Risotto. Sliced mushrooms fried in butter can be layered with diced potatoes that have been boiled until soft. Simply add salt and pepper, pour over some cream and bake in a hot oven for 20 minutes for a deeply savoury gratin that needs nothing more than a green salad for accompaniment. Thinly sliced Lardo draped over fried Porcini is a luscious option. Pears, like apples, are uninteresting if all you can taste is sweetness. A good balance of sweetness, acidity and musk is essential to reveal the pear’s gentle flavours. It was largely thanks to the passion for fruit and vegetables of Louis XIV of France that Pears reached their high level of appreciation. Royal patronage oversaw pear production change from difficult-to-manage open orchards to tamed espaliered trees. These allowed for easier and effective control of shelter, warmth, hybridisation and harvesting. A need to please a King created a passion for pears. Although the pear tree, Pyrus communis, is not native to our islands, it has been grown in the UK since at least the 10th century. Some say they arrived, even earlier, with the Romans. Pear trees can still be found growing wild in hedgerows. Improved pear cultivars were brought into the UK from France and Belgium and new varieties then began to be developed here too. The trees are particularly long-lived and can survive for up to 250 years. By the 17th century we were grafting pear tree cuttings onto quince rootstock, making it easier to grow pears in our typically wet spring climate. Records show varieties of pear under cultivation in the UK increased from 64 in 1640 to 622 by 1826. Today the National Fruit Collection website lists 530 varieties but very few are under commercial cultivation. Concorde and Conference, and to a lesser extent Williams’ Bon Chretien (called Bartlett in the USA), make up most of the UK’s commercial crop. The last of these is still known in Berkshire, where it originated, as ‘Stair’s Pear’ in acknowledgment of its original cultivator John Stair, a local schoolmaster, rather than Mr Williams and Mr Bartlett who introduced it to a wider audience and, modestly, named it after themselves. There’s little chance of finding red-skinned Laxton’s Early Market or russet-skinned Mrs Seden for our customers now, but they could well still be growing in someone’s back garden. Here at Puntarelle & Co we source English-grown Pears through the autumn months. Varieties include russet-skinned, silky-textured Beurre Hardy and Triumph of Vienna - an old French variety with red flush, russet-patched skin and smooth, juicy white flesh. We also buy Italian ones like Abate Fetel and buttery, melting, Doyenne du Comice from France. Beurre Bosc and Beurre d’Anjou are late varieties that are relatively good keepers so we tend to get this type into the New Year. Pears need to be picked when firm then ripened off the tree, but they store far less well than apples. Once bought, keep at room temperature until the fruit gives very slightly around the stem, indicating ripeness. Pears love chocolate and spices like cinnamon and vanilla, and partner well with cheese, particularly a blue like English Stilton or Stichelton, a French Roquefort or Italian Gorgonzola. What to do with them: assemble a salad of chicory leaves, sliced pear, blue cheese, walnuts or toasted hazelnuts dressed with a vinaigrette; slice and bake pears in a pastry tart or galette; pickle the sliced fruits with sugar, white wine vinegar, cloves, allspice and nutmeg to serve with roast ham or pork; peel and poach them whole in red or white wine with a little sugar; bake halved, cored pears in a little marsala or maple syrup; use in an ‘upside-down’ cake; or instead of apples for a tarte tatin; then, of course, there is the classic dessert Poire belle Helene – pears, chocolate and ice cream. In late August the most luscious black Figs usually arrive from France. Many fig trees, when grown in the hot and dry conditions of a long summer, produce two crops a year. The first fruits, known as breba, develop in Spring on the previous year’s shoot growth and are harvested in early summer. The second crop develops mostly on current season stems. These fruits, grown at the hottest time of year ripen in late summer into autumn and have an unparalleled honeyed sweetness. The fig is a member of the Mulberry family and is more flower than fruit; being a fleshy flower base that has folded in on itself. The inner female florets develop into small individual dry fruits that crunch like seeds. They contain a surprisingly large amount of calcium for a fruit. Notable European fig varieties include Black Ischia, (dark purple in colour with golden flecks and a luscious violet-red pulp); Adriatic, (a green fig tinged with purple or red with deep red interior); and the sweet Marseilles, (coloured yellow/green with green flecks and a white pulp). The honeyed quality of their flesh means figs are not only good for desserts but match beautifully with savoury ingredients like anchovies, poultry and air-dried meats. They pair equally well with pungent creamy cheeses like Gorgonzola or Stilton, or a milder soft goat’s cheese. Thyme is a herb that mingles happily with figs. For a sweet end to a meal, they are delicious just as they are – particularly if they are so luscious they have begun to split - but they go well with chocolate, nuts and orange and spices like aniseed, cinnamon and vanilla. Less ripe ones are delicious baked in the oven in red wine, sugar and spices and maybe a little orange zest too. And don’t forget, figs make wonderful chutneys and jams. This recipe is a seasonal marriage of green beans and figs, both of which are at their best at the same time. You could use Runner Beans, French Green Beans, or the Bobbi Bean variety. If all you want is those beautiful figs, I can’t think of anything better than to cut them in half and eat with a spoonful of ripe Gorgonzola. Bring a pan of water to the boil and salt it. Top and tail (and slice if using Runners) the beans. Add to the water, bring back to the boil and cook for 2-3 minutes until the beans still have a little bite. Drain, plunge into cold water (to retain the colour) then dry on kitchen paper. When ready to serve, re-emulsify the dressing, toss the beans in it then divide them between four plates. Briefly place the rocket leaves in the dressing left in the bowl then add to the plates. Quarter the figs and arrange on the plates. Add the shaved parmesan and pour over any remaining dressing. Being able to buy Grapes all year round can make us take for granted this important food, which is one of our earliest cultivated plants. But the European season is in full swing so there’s no better time to buy them. We can eat the fresh fruits off the vine, make them into wine, dry them to make raisins and currants for storing, and press unripe fruits to make verjus to use instead of vinegar. The grape’s seeds can also be pressed to produce a cooking oil. Their tender young leaves can be used as edible wrappings – think of dishes like dolmades in Greece; warak enab in Lebanon; and yaprak sarma in Turkey. Vine prunings can be tossed onto hot coals to add flavour to grilled food and even the old wood cut-backs make good firewood. No wonder we were quick to recognise the value of the grapevine. There are thousands of grape varieties, most of the word’s crop - around 2/3 - goes to make wine, the other third being eaten either fresh or dried to make raisins. Most wine grape varieties are acidic, which helps to control the yeast fermentation, while table grapes come in large clusters and are generally sweeter. Most commercial eating varieties today have been bred to be seedless and to have a long storage life, the commonest being the ubiquitous ‘Thompson Seedless’. Grapes suitable for eating fresh are quite diverse and worth seeking out. Ranging from pale yellow to deep purple, seedy to seedless, their sugar content can range from 14%-25% and their acidity 0.4%-1.2%. And it’s worth remembering that seedy varieties often have the best flavour. If you want to cook with grapes, here are a few ideas. In wine-growing regions of Italy they make Schiacciata – a focaccia-like bread – where grapes, and sometimes sprigs of rosemary, are spread over the surface before being drizzled with honey or scattered with sugar then baked; you can roast grapes in olive oil in a hot oven for 10 minutes until just bursting and serve with roast meat – particularly good with pork and game; add some to a pan of fried sausages and onions towards the end of cooking; make a Grape sorbet with deep purple Italian Uva Fragola, or Concord, grapes. The Spanish make Ajo blanco, or white Gazpacho, a chilled soup which originated in Malaga: well ground almonds are mixed to a soft paste with a little water, briefly soaked white bread and garlic is added before whizzing all together in a food processor. Iced water, or milk, goes in until the consistency is that of single cream. A little salt, pepper and sherry vinegar is added to taste then the soup is chilled for at least and hour. White grapes, preferably spicy Muscat, are added just before serving. Here at Puntarelle & Co, it’s time to celebrate the European season for grapes. The Italian deep-purple Uva Fragola have arrived. Seedy, with a firm skin, they have a distinct strawberry and exotic fruits flavour, makes perfect Water Kefir by London Fermentary. The thinner-skinned, perfumed Muscat grape is also here. Its gold/green to shell-pink translucent orbs hold spicy, musky flavours. These two are hard to beat but we’ll have other varieties to add to the mix this autumn. The first of the Coco de Paimpol usually arrive early in July. These semi-dry white haricot beans have an AOP designation of origin so only beans grown in a small coastal area of Brittany can be named Coco de Paimpol. The temperate climate in this area allows for a long, slow growing period producing thin-skinned pods and a tender seed coating. The plants are uprooted once the beans have reached the stage when the pods are just beginning to show signs of drying and then harvesting is done by hand. The pods of Coco de Paimpol are pale yellow/cream with light violet markings – less showy and smaller than a Borlotti. The bean has a delicious nutty flavour and cooks quickly to a particularly creamy consistency. That creaminess pairs beautifully with fish – a pan-fried fillet of cod, or other white fish on a bed of Coco de Paimpol with, maybe, a few Girolles mushrooms would be my choice. For a tasty, nutritious, vegetarian dish, pod the beans and cook them for 2-3 minutes. Add them with a little of the cooking water to sliced onion which has been cooked in oil until soft, chopped tomato, thyme leaves, salt and pepper; pour into a gratin dish, cover with breadcrumbs and bake in the oven to brown the crumbs and bring all the flavours together. Corn, or Maize, was domesticated in Mexico 7,000-10,000 years ago. Originally barely the size of an ear of wheat, it was developed by Inca and Mayan farmers into the long, plump, cigar-shaped cobs we know today. Within a generation of Spanish Conquistadors bringing it back to Europe, corn was being grown throughout southern Europe. It was prized in southern Europe as a cereal crop for making cornbreads and turned into porridges like polenta in Italy, and pulientas in Spain. Initially in the UK, maize was valued only as a feed for poultry then, later, as something you could refine into cooking oil. The liking for sweet corn-on-the-cob came late to British tables, influenced by the American taste for it. Now, as the British climate warms, good corn-on-the-cob can be grown here to follow on from the French harvests we buy. Sweetcorn should be cooked as soon as possible after harvest as its natural sugars quickly convert to starch. Right now we are getting plump, sweet corn-on-the cob from Kent growers. If you plan to boil your cobs, this should take up to 10 minutes, but remember not to add salt to the cooking water as the kernels will toughen. Whether you boil them or cook them on the barbecue, smothering them in butter or olive oil is a good idea, as is a seasoning of sea salt and, maybe, some chopped chillis to challenge the sweetness. You can slather the warm cobs with crab butter or slice the kernels from the cob and make a crab and sweetcorn soup. Alternatively, you could cream your sweetcorn: slice the kernels from the cob and place them and any juices from the cob into a small pan, add a knob of butter and a sprig of thyme, cover and cook on a moderate heat for about 5 minutes until the grains have softened then add salt, pepper, 2-3 tablespoons of double cream and top with a poached egg. What started out as small bitter berries growing wild in western desert areas of South America, were domesticated by the Aztecs and transformed into tomatl (plump fruit). Despite the fact Tomatoes were first brought to Spain from Mexico in the 15th century, they were viewed with suspicion here until the 19th century. We took much more readily to the imported potatoes and tobacco, despite the fact all three belong to the same plant family – Nightshade. It was the tomato’s perceived resemblance to Deadly Nightshade that held up our acceptance of what is now a firm favourite on our continent. Good Tomatoes are the defining taste of summer and now is the time eat your fill and preserve, preserve, preserve. The tastiest tomato is rarely the best-looking one – but then beauty is in the beholder. The more imperfect its appearance, the more interesting its flavour can be. Store them stalk-side down on your kitchen counter, not in the fridge, to enjoy them at their most flavourful. We source most of our tomatoes from Italy and France but when growing conditions are right – as they surely are this year – we buy English ones too. Now, in late July, Italy is to the fore. You will find the Sorrento, grown in the rich volcanic soil around Mount Vesuvius - don’t be fooled by their scarred appearance, their fleshiness and taste is exceptional; the meaty Cuore di Bue (ox heart), originally grown in Liguria, are coming in from Sicily now; Cherry and Datterini are here too. As I write we are keeping our eyes peeled for good English tomatoes for this week’s selection. The Tomato’s relatively low-sugar content for a fruit (3%), along with its high amounts of savoury glutamic acid, is why we treat it most often as a vegetable. Rich in Vitamin C, the red varieties deliver a high does of the antioxidant Carotenoid Lycopene. Studies have shown that concentrating tomatoes down into a paste or sauce makes the antioxidant particularly potent. The sweet/acid character of tomatoes pairs particularly well with herbs like basil, marjoram/oregano, and thyme. The tomato appreciates salt and salty foods like anchovies, cheese and olives and a cream tempers its acidity. In the current hot weather thoughts turn to a soothing cold tomato soup; or peppery Gazpacho; a no-cook Middle Eastern Fattoush bread salad or Greek Feta salad; or simply selecting the ripest tomato in your bag, slicing it, adding salt and a good olive oil. You could stuff large tomatoes with rice and bake them slowly in the oven; make a mousse, a sauce or even a jelly. Bring out the tomato’s fruit nature and make it into a dessert. Kitty Travers includes a recipe in her La Grotta Ices book for Tomato and white peach sorbet which emerges an elegant shade of shell pink, tasting softly sweet and fruity – just the thing for cooling down in this incredibly hot summer. 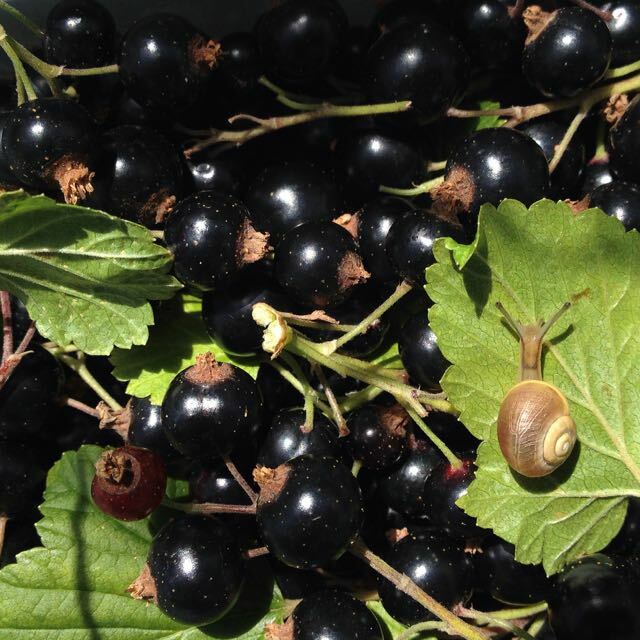 A cool region plant, the Blackcurrant (Ribes nigrum) thrives in the British climate. Much more acidic than white or red currants, it is closer in this regard to its relation the Gooseberry. Its intense aroma comes from the many spicy terpenes, fruity esters and a sulphur compound that is also to be found in gooseberries, green tea and Sauvignon Blanc wines. The Blackcurrant’s resinous character needs to be tamed by briefly cooking with sugar and a little water to reveal its qualities. The Blackcurrant is not only versatile and delicious but exceptionally rich in vitamin C and antioxidants. Its strength of flavour means a little goes a long way. Blackcurrants also freeze extremely well. The leaves of the blackcurrant shouldn’t be overlooked. They are highly aromatic and can be infused in a syrup or a custard to impart a flavour which Kitty Travers of La Grotta Ices interprets as “white acid drops”. Their season is relatively short but you can normally expect to see blackcurrants from early- to mid-July and into August. The French value them mainly for the making of their Crème de Cassis cordial – essential for the white wine aperitif, Kir. Much of the UK Blackcurrant crop is harvested for a well-known sweet, sticky blackcurrant drink but we buy ours from our favourite fruit farm in Kent. As well as selling them by the punnet, they go into our London Fermentary healthy, tangy Blackcurrant Water Kefir. Blackcurrants pair well with mint, anise, chocolate and coffee flavours. They respond exceptionally well to cream. High in natural pectin, they are easy to preserve and make a deeply flavoured syrup, jelly (good stirred into meat juices) or jam; a highly aromatic sorbet and a luscious ice cream; outstanding with a creamy syllabub or a posset; a crumble or pie, on their own or teamed with pears; and they’re a wonderful addition to a Summer Pudding with raspberries - Nigel Slater champions a Blackcurrant and Blackberry version of Summer Pudding, with the proviso that plenty of cream be deployed. It took a while to make an appearance but finally, in the last week of June, summer arrived and with it the glorious fruits of summer. July is the time to make the most of these vitamin and mineral-rich seasonal fruits by eating them now at their peak or preserving them for later in the year. English Soft fruits have been loving the heat and we are lucky to have hand-picked berries from John, our Apple and Pear grower in Kent. Both Strawberries and Raspberries are fabulous this year. Locally-grown English Raspberries, in particular, are unbeatable for flavour. We use these Kent-grown berries in our London Fermentary Kent Raspberry Water Kefir. We also get Blackberries from the same farm in Kent. Large, plump and deeply-flavoured, they are bursting with juice. It’s proving to be a great year for British Blackcurrants too. Gooseberries should be around until mid-July and British Cherries are starting to arrive, taking over from the lovely Provence/French, Italian and Spanish ones we have had for a few weeks now. Melons are popular at Puntarelle in this warm weather that encourages us to eat more cooling fruits. 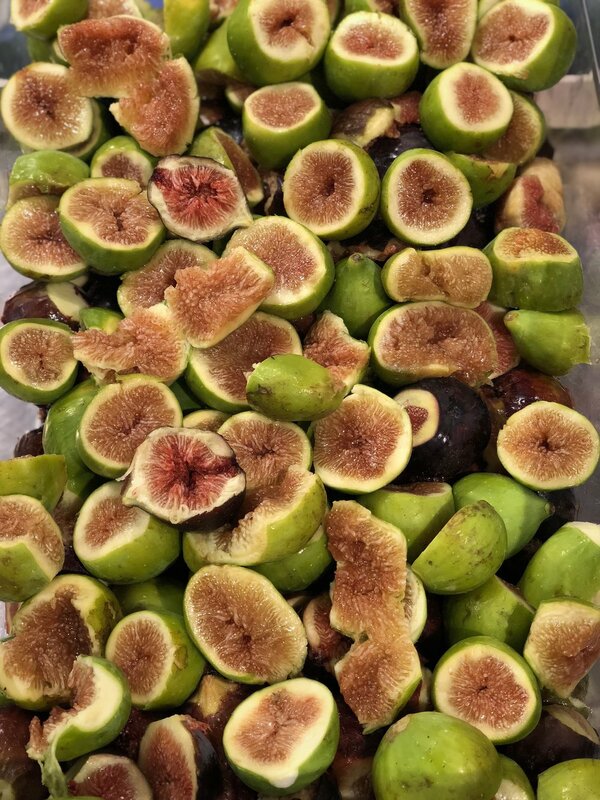 We are getting our Green Fioroni Figs from Puglia at the moment - large and very juicy. 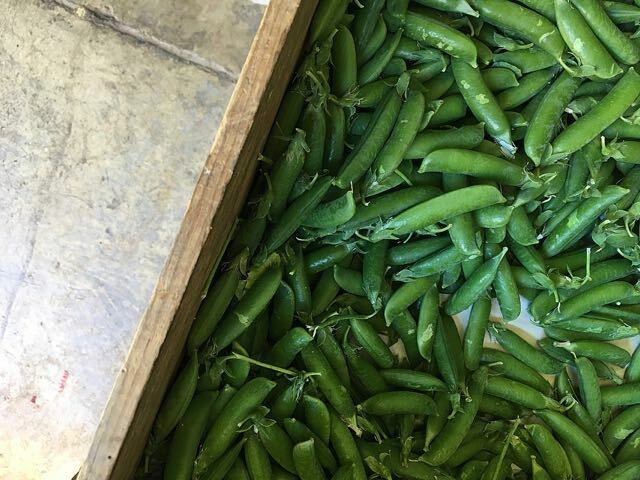 On the vegetable side, the highlights for July are English Peas . The harvests are as sweet and plentiful as they were last year. English Broad Beans are excellent this year too. We will move into the British Sweetcorn season in July, taking over from the Continental corn cobs. We look forward to its arrival as the British is usually the best of the crop. All British grown herbs are in their prime too! We expect to get particularly good sun-ripened Italian Ox-Heart Tomatoes (Cuore di Bue) and Vesuvius tomatoes, both varieties are meaty, juicy and very delicious. On the London Fermentary side of our business, we are delighted to announce our first Inspirational Fermentation Course was completed with great success this summer. The results were exceptional. Thank you to all who attended. It was such a pleasure to teach our first group of talented and creative people. Dates for the next course are set for September 2018. Visit www.londonfermentary.com to book your place (only 5 spaces still available at time of writing). This is an easy recipe from Evie’s blog for turning ripe cherries into a more special dessert. Sabayon is so easy to make. It takes only 2 minutes of whisking with an electric whisk if you want a warm frothy sauce to eat immediately, 5 minutes to produce a 'creamier' one. If you want to make it up to an hour ahead (the one in the photograph above), you just need to keep whisking it off the heat until it has cooled. This stops it separating before you get to eat it. Melons are fruits of the Cucumis melo and closely related to the cucumber. The exception is the Watermelon (Citrullus lanatus) which is a scrambling and trailing vine eaten by the Egyptians for some 5,000 years. In its wild form the Watermelon is very bitter. Here I want to talk mainly about Melons. We’ll save Watermelons for a later day. The melon plant was cultivated in Asia and India and, by the first century, had arrived in the Mediterranean area. There are many varieties but the most common fall into two categories: ‘Summer Melons’, which appear in early summer and are highly aromatic and perishable – the Cantaloupe, Charentaise and Ogen melon are examples; and ‘Winter Melons’ which are less perfumed and keep longer – the Honeydew, for instance. The Charentais, with its smooth grey-green rind and highly aromatic dark orange flesh is arguably the best-flavoured melon of all. The Cantaloupes, also known as Muskmelons, have a creamy-white rind, sometimes streaked with yellow, and a firmer flesh which can be very sweet when they are fully ripe. Right now, in the last few days of June, we have orange-fleshed Cantaloupes from Italy. We also have smooth-skinned Honeymoon melons, which are an early ripening variety of the Honeydew. We have plenty of thirst-quenching Watermelons from Sicily too – perfect for cooling down in this warm spell. Good melons should seem heavy for their size and, when ripe, will be slightly soft at the stalk end. The seeds of the melon are edible. Scoop out the seeds, dry them and roast in a medium-hot oven. Melon with Bayonne or Parma Ham is a classic pairing; their sweet, perfumed flesh is a good choice for making into a water ice; try halving a melon, deseeding and filling the cavity with raspberries and a tablespoon of sweet wine, like Sauternes; make a melon and ginger jam (with sugar, lemon and preserved ginger); or a melon rind pickle (with sugar, vinegar, lemon, cinnamon and cloves) – one last mention for the Watermelon because this pickle is particularly good made with watermelon rind.